Renting out motorcycles is a great way to earn nearly passive income on your woefully unused motorcycles. You aren’t going to get rich, but this is a way to make affordable owning too many motorcycles — as long as you’re willing to do basic maintenance. This was my most profitable motorcycle on Riders Share, a Honda CB900 (919). Came with luggage, a windscreen, a hundred tractable horsepower and a bulletproof engine. You can get bikes like this for $2,000 with reasonable miles, rent them out and have a lot of fun too! Motorcycling is a money pit of a hobby. Generally speaking, you can spend anywhere from a minimum of hundreds to many thousands a year on regular upkeep (chain, tires, oil etc. 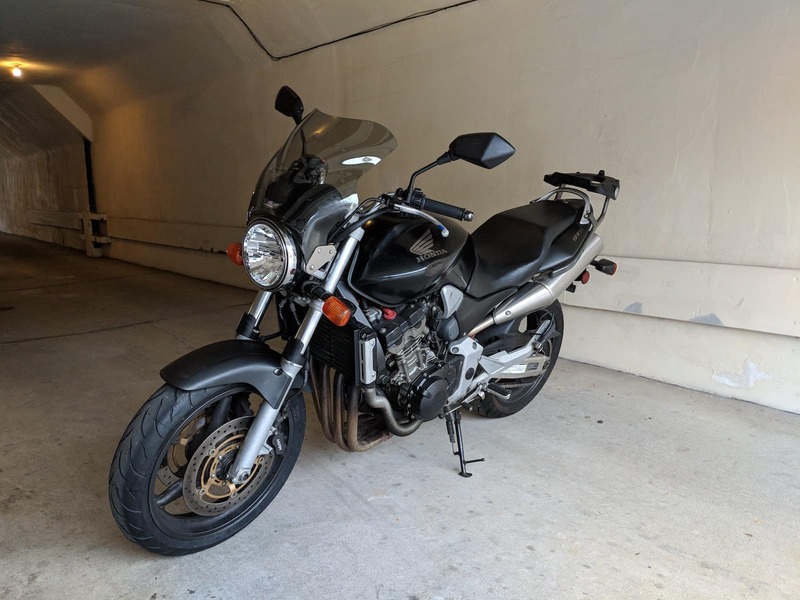 ), major services, registration, insurance, gear, parking tickets, undercover parking, and that's before you buy those new motorcycles you've lusted after. It really adds up! Until recently… Renting out your motorcycles is a way of making owning a motorcycle less painful. And in some cases… profitable! Here’s how — a magical new startup based in Los Angeles called Riders Share. 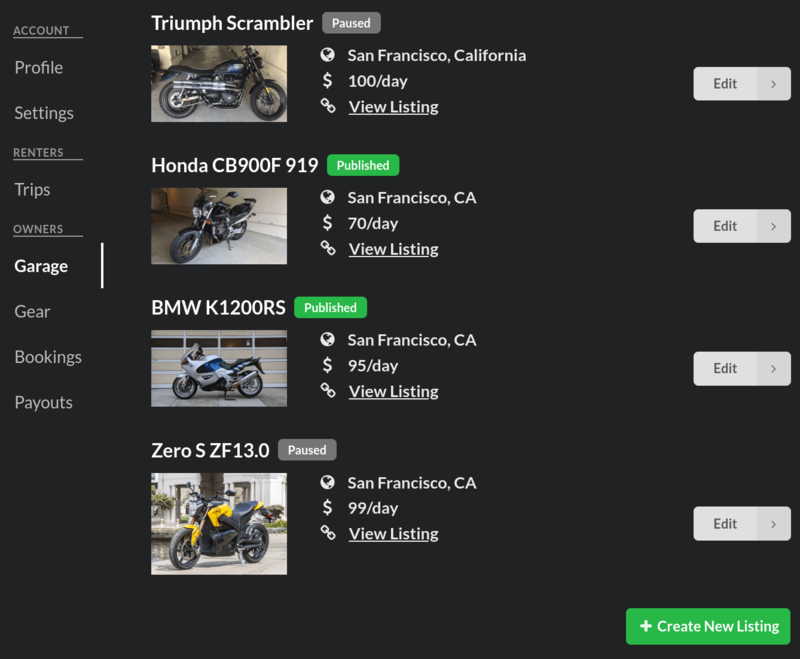 Founded by Guillermo Paco Cornejo, it basically works like Getaround does for cars, but for motorcycles. You make a listing, add photos and pricing, and then (if there’s demand for your model and at that price), watch the bookings come in. My garage. While I had them listed, the Scrambler and the Zero were very popular options. Most people ride just on weekends. Some, not even every weekend. There’s a popular statistic that John Zimmer of Lyft likes to mention, that cars are >95% unutilised — just sitting around in parking spaces. This number must be SO MUCH HIGHER for motorcycles. On the other hand, demand (usually by out-of-town travellers) is high. You can buy a popular older motorcycle that is low maintenance, of generic appeal and reliable, and have a reasonably high ROI. How much money can you make? It depends on the model and pricing (see the tips below). But you can make around $1–2K per year per motorcycle, which is pretty amazing considering it’s something most people SINK a lot more money into. Here’s a simple model I made to show this. You’re going to have to buy a motorcycle. Maybe a second one, if you don’t want to rent out your first (it’s your baby/it’ll be too nightmarish dealing with a crash/you don’t want people to thrash your R1). There are two ways of doing this. Either rent out an older motorcycle, one that is worth $2–3K — generally anything 15 years old or older, that has stopped depreciating. Motorcycles this old maintain their value, which is mostly the value of something that runs, plus regular maintenance and renewing of things that go bad like tires, chains, oil. Alternatively, you might also want to buy a newer motorcycle, and consider your investment to be the purchase price minus the eventual sales price — it is possible to factor in selling the motorcycle in a few years for a lower price. For example, I could justify buying a newish Triumph Bonneville for $7,000, then selling it for $5,000 in two years time. Ongoing costs include two major parts. One is regular maintenance (tires, chain/sprockets, oil, plugs, filters), and one is major service (valves/seals). Most regular maintenance you can do yourself, but you can even outsource that if you need to. Few people choose to do valve inspections and adjustments on a range of motorcycles (unless they LOVE being a mechanic), so feel free to outsource that to a competent local mechanic. Here, I look at EBITDA — i.e. not factoring in depreciation costs or the amortization of major spend. 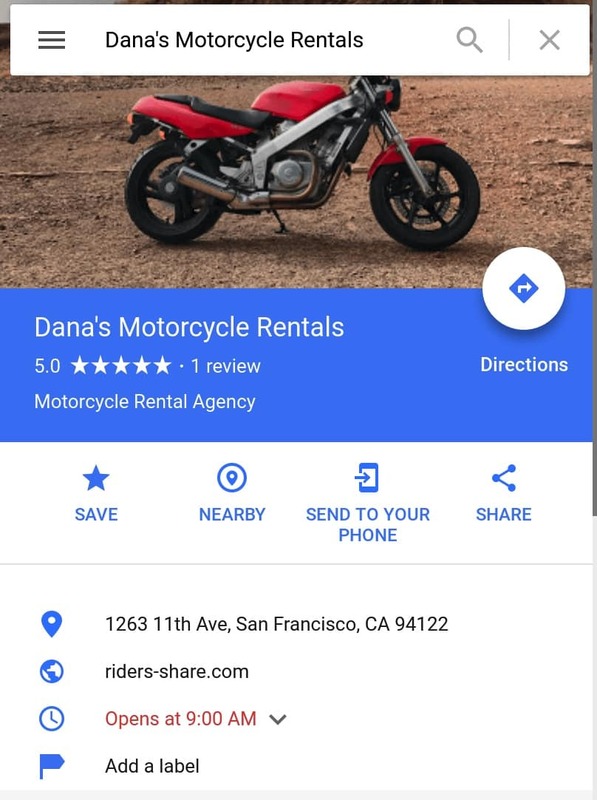 This is because I presume anyone renting out a motorcycle would be renting out something slightly older, which have negligible depreciation costs (the value is maintained and directly relative to how well maintained they are). Also, EBITDA is the best way to understand payback period relative to your investment (either the total purchase price of an older vehicle, or the depreciation of a newer one). Have a great listing that appeals to the target market. If you’ve sold motorcycles before, this is different kind of copy. Think of your target: probably out of town, many just looking for fun. They’re not looking for a dream ride, they’re just looking to blast around. I’ve rented a 250cc single cylinder in random countries and had a HOOT compared to the alternative (a buggy or car). Depending on the part of the country, they might want to get to some of the long roads out there. So write a listing with copy that bears this in mind. Sell the feeling, don’t sell the motorcycle. You don’t need to worry about dings in the paint or if it has a salvage title. Buy some cheap gear (helmet, gloves). You know those $100 helmets you’d never wear yourself? Well, as long as they’re DOT approved and in good condition, those are the difference between life and death, and in many states, between legal and illegal. Having helmets on hand will help the rental happen with those many out-of-towners who didn’t even think to bring a helmet (90% of them), or those who would rather not because they’re huge. Buy size large. It’ll do for most people. Offer services to help, and make this explicit in your ad. Let them store gear at your house if they over-packed. Give them tie-downs for their luggage and locks. Make sure your motorcycle is equipped with a phone mount and charger. Offer a ride to/from their hotel or AirBnB if practical. All this stuff helps! Be strategic with pricing. Check other ads in the area. Don’t price based on cost to yourself; priced based on what is likely to be attractive to a potential renter. Just one more reason not to rent out that 2018 model BMW R1200GS. Do your own basic maintenance. After every renter returns their motorcycle to me, I clean and lube the chain and wipe it down. I start it and check the miles and see if it needs an oil change, and look at the brake pads. Aside from that, motorcycles don’t need much. When it comes to major service, you can opt to do your own valve inspections or outsource it. Do your own marketing & promotions. I don’t actually know what benefit this had, but I opened a Google Business site and made some posts. I took my phone number off (I just got a lot of phone calls that went nowhere). Here are a few things people keep asking me, so I’ll answer them here. How do you let some random person ride your motorcycle?? I would never do that! It’s quite hard to watch your baby go the first time. No matter how attached you are to your motorcycle, it’s difficult watching someone else ride it off. Even when you sell it! Aside from this, bear the following in mind. Firstly, most motorcycle renters are like you — lovers of the hobby, people who pay attention to their machines. To most people who I’ve met through Riders Share, I’d have lent the motorcycle anyway. I’d probably have been their friends or riding buddies. They seemed cool. I bet they’d have done the same for me whenever I visited their home town. I’ve never met any bad riders. Secondly, you could consider buying a ‘backup’ motorcycle to rent out, something you’re willing to let go. One person dropped one of my bikes and scratched up the clutch cover a bit plus broke a brake lever. On anything unscratched, especially a new and expensive model with fairings, this would have been a major hassle. So think of all those motorcycles you’d buy if you could afford keeping them. Older machines that aren’t a Panigale V4. 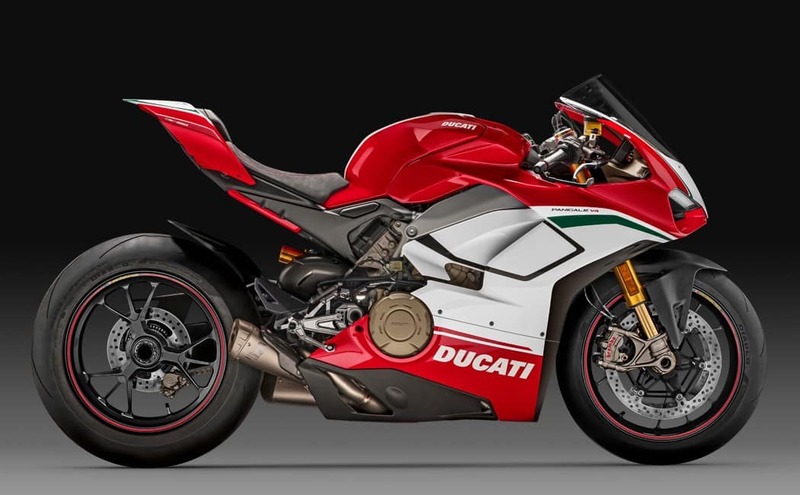 These are all machines that are reasonably reliable and unlikely to completely cark out on you (which is why I didn’t have a Ducati in the list, as much as I love them. I don’t want to do that much valve maintenance, as renters can put hundreds of miles a day on machines). What about insurance? If they crash it, is it going to hurt my premiums? Riders Share has a third party insurance policy with no risk to you, the motorcycle owner. Read it. Basically, the rider is liable for up to $2,000 themselves, and then after that it’s covered by their insurance policy. I’ve never used this website. How do people find out about you? Every person I’ve rented to has been using the website for the first time. They all have a similar story: They wanted to come to the Bay Area, they wanted a motorcycle, but didn’t want to fork out $150+ for a motorcycle from one of the major shops. So they found the website and found my machines. In putting this post up, I’m hoping more people will find mine (and yours). Write about it! Publish about it on your local motorcycle forum! Every link helps the community grow. In summary, this isn’t a get rich quick scheme. It’s simply a way of saying you can own a motorcycle to have fun with sometimes and let others have fun with it on occasion, too.